Seville casts a spell of enchantment over visitors from the minute they step foot on the quaint cobblestone lanes and stroll the palm-lined promenades. Elegant edifices, old-fashioned street lamps, and horse-drawn carriages create a magical ambience, and the sights are as stunning as the atmosphere. Seville's cathedral is the largest Gothic church in Christendom with a majestic tower that was once the minaret of a great mosque. Another relic of the Moorish past, the Alcázar dazzles with its lavish Mudéjar decor and lush gardens. Discover the charm of this quintessential Andalusian city in the peaceful courtyards and winding alleys of the medieval Barrio Santa Cruz. Take a walk through the beautiful Parque de María Luisa, and bask in the sun at the Plaza de España, Seville's most graceful square. Fun-loving tourists will want to watch the feisty flamenco performances and take part in the city's famously flamboyant festivals. Plan your trip to this enchanting city with our list of things to do in Seville, Spain. Seville Cathedral is the largest Gothic cathedral in Christendom, unmatched in its impressive scale and abundance of art treasures. Listed as a UNESCO World Heritage Site, this incomparable monument was constructed between 1402 and 1506 on the site of the town's principal mosque. The Giralda Tower was originally the minaret of the mosque built in the 12th century by Almohad Moorish rulers. This 93-meter-high tower of the cathedral is still the emblem of Seville. Entering the cathedral, visitors are surprised by the immense proportions of the nave. The five-aisled interior extends 117 meters in length and 76 meters across and soars to 40 meters in height. This overwhelming space is the most grandiose Gothic interior in Spain. The Capilla Mayor (Main Chapel) features a resplendent retablo, considered a masterpiece of Gothic woodcarving. In the center is a silver image of the Virgen de la Sede surrounded by 45 scenes from the Life of Christ and the Life of the Virgin. In the south transept stands a striking monument to Christopher Columbus, fitting of his historic stature. Behind the Capilla Mayor is the Capilla Real (Royal Chapel). Built between 1551 and 1575, this domed Renaissance chapel contains the royal tombs. The Sacristía Mayor is a magnificent 16th-century chamber, which contains a large candelabrum and a crucifix by Pieter de Kempeneer. Within the Sacristía Mayor, the Treasury displays the precious gem-adorned crown of the Virgen de los Reyes. Another notable feature is the Patio de los Naranjos (Patio of Orange Trees), which was the forecourt of the mosque. The octagonal fountain in the center is a remnant of the fountain used by worshipers for religious ablutions in Moorish times. Located on the east side of the Patio de los Naranjos is Biblioteca Colombina. The son of Christopher Columbus, Hernando Colón, put together the collection for this library between 1496 and 1539, and it is one of the most important collections of Renaissance-era volumes in Spain, with a special focus on the humanist writings of the Golden Age. One of the most noteworthy items in the collection is the Libro de las Profecías, a biography of Christopher Columbus. The best way to appreciate this magnificent cathedral is on the Skip-the-Line Cathedral and Alcazar tour. Not only will you save time standing in line on this two-hour small-group tour, you'll also learn about the fascinating history of Seville and these two UNESCO World Heritage-listed attractions from an expert guide. For a break from sightseeing after visiting the cathedral, head to the Calle de las Sierpes, north of the Plaza Nueva. This narrow pedestrian lane is Seville's main shopping street, lined with shops, cafés, and restaurants. For a special treat, stop at the Confiteria la Campana to sample enticing Andalusian confections such as candied figs, oranges, and pears. Listed as a UNESCO World Heritage Site, the Real Alcázar was originally the medieval fortress of Moorish rulers and later of the Christian kings. The palace was built in the 10th century for Moorish rulers. In the 11th century, it was governed by the legendary Moorish ruler and poet al-Mutamid. After the Christian Reconquest in the 1360s, Moorish architects created the Mudéjar-style buildings for King Pedro the Cruel. Visitors enter the palace through the Puerta Principal, which leads to the Patio de las Doncellas. This elegant courtyard was built between 1369 and 1379 and exemplifies Islamic architecture, with magnificent arches featuring open arabesque work above 52 marble columns. The oldest of the rooms, the Sala de los Embajadores (Hall of the Ambassadors) has a splendid stalactitic dome ceiling, with decorative friezes and inscriptions in Arabic script. Off the Patio del Leon (Patio of the Lion) is the Sala de Audiencias, one of the most ornately decorated rooms in the palace, featuring a lavish artesonado (intricately carved wood) ceiling. Be sure to save plenty of time to explore the gardens. These beautifully manicured grounds are filled with leafy palms, sweet orange trees, and colorful roses. In traditional Andalusian style, courtyards, decorative pools, and refreshing fountains are the centerpieces of the landscaping. Across from the Alcazar is the Casa Lonja, which houses the UNESCO-listed Archivo de Indias, an archive of documents from Spain's colonial years in the New World. Inside the Parque de María Luisa, the Plaza de España is one of Seville's most impressive landmarks because of its scale and grandeur. The enormous 50,000-square-meter plaza is surrounded by the balustraded balconies of a Renaissance Neo-Moorish-style building. This semicircular building curves around, following the shape of the canal running through the square. A monumental fountain is a graceful centerpiece of the square, while the peaceful canal is crossed by four footbridges. Tourists can rent a rowboat for the afternoon to experience the "Venice of Seville" or opt for an equally romantic horse-drawn carriage ride through the park. The Parque de María Luisa, with the Plaza de España at its center, was the site of the Exposiciones Universales in 1929. The park is close to the river, and the main entrance is at the Avenida de Isabel la Católica. This expansive and beautiful green space was created by the Infanta María Luisa Fernanda de Borbón. The grounds are filled with exotic palms, orange trees, elms, and Mediterranean pines. Lovely historic buildings and colorful tiled benches add to the park's dreamy ambience, and the landscaping features decorative flower beds, shady avenues, Moorish fountains, and ornamental pools. Brimming with old-fashioned charm, the Barrio de Santa Cruz is one of the most charming places to explore in Seville. It was the Judería (Jewish quarter) during the medieval era under Moorish rule, when many of the quarter's churches were originally synagogues. The Barrio Santa Cruz is found in between the cathedral and the Alcazar of Seville. This medieval neighborhood is characterized by its labyrinth of cobblestone pedestrian lanes (too narrow for cars), whitewashed houses with attractive patios, and picturesque plazas with outdoor cafés. Many of the quiet courtyards, such as the Plaza Doña Elvira, are planted with fragrant orange trees. The Plaza Santa Cruz features rose beds and a 17th-century wrought-iron cross in the center. At the Plaza Refinadores, visitors will find a statue of Don Juan Tenorio, a famous local literary character. The Barrio Santa Cruz has two noteworthy museums: the Centro de Interpretación Judería de Sevilla (Calle Ximenez Encisco 22A), which illustrates the history of the city's Sephardim (Spanish Jews), and the Hospital de los Venerables Sacerdotes (8 Plaza de los Venerables), a 17th-century hospital for retired priests, which now houses the Fundación Focus Abengoa collection of Spanish paintings and sculptures. One of the special things to do in Seville is stroll through the Jardines de Murillo, beautiful gardens filled with palm trees, fountains, and colorful tiled benches. For an excellent view of the cathedral, head to the Plaza del Patio de Banderas. Seville has an exceptional museum of fine art, housed in the evocative 17th-century Convento de la Merced. This museum is considered to have the best collection of painting in Spain after the Prado in Madrid. The collection covers art works from the Gothic period through the 20th century. The representation of works by 17th-century Spanish painters is especially noteworthy. Visitors will see some of the best paintings by famous Spanish artists including El Greco, Pacheco, Velázquez, and Alonso Cano. The museum has a special focus on masterpieces by Murillo, as well as works by the Seville school of the 17th century. The religious paintings by Zurbarán are also excellent. A six-minute walk from the cathedral and usually included on the cathedral entrance ticket, the Iglesia Colegial del Salvador is a stunningly beautiful Baroque church. Construction began in the late 17th century on the site of Ibn Adabbas, Seville's main mosque, and many additions have taken place since this time. Glowing pink in the late afternoon light, its ornate facade is influenced by the Mannerist-style, and the richly-carved and gilded interior is a treasure trove of Sevillian Baroque details and impressive artwork. Among its most spectacular altarpieces are Sacred Christ of Love by Juan de Mesa and Jesus of the Passion by Juan Martínez Montañez. Other highlights are the soaring dome, 18th-century organ, and sacramental chapel. Like the cathedral, this lovely church also includes a courtyard with orange trees. A handy tip is that you can purchase a combined ticket here for Iglesia Colegial del Salvador and the Catedral de Sevilla, which allows you to skip the typically long lines at the cathedral. The Semana Santa celebration in Seville is one of the most exciting festivals in Spain. Following centuries-old traditions, the Catholic brotherhoods (cofradías and hermandades) from different quarters of town participate in elaborate processions. Clad in penitents' garb, they carry impressive floats, which display ornately decorated figures of saints. The main procession is the eve of Good Friday and on Good Friday morning, and the ceremonies held in the cathedral during Holy Week are particularly splendid. During the rest of the year, visitors can still see the famous icon of the Holy Week procession at the Basilica de la Macarena (Calle Macarena). This church possesses the figure of the Virgen de la Macarena, which is displayed on a lavish float during Holy Week. With a tender expression and tears running down her cheeks, this Virgin figure evokes an emotional response. The Museo del Baile Flamenco celebrates the beauty of flamenco with exhibits on all aspects of the art: dancing, singing, and guitar. This innovative museum features flamenco costumes, creative video displays, and other educational exhibits. The museum also has a Flamenco School and hosts professional Flamenco Performances daily from 7-8pm all year long. Attending a flamenco performance is one of the most popular things to do in Seville at night. Another place to see authentic flamenco dance is at El Palacio Andaluz, a traditional tablao-style (small venue) theater, which offers intimate performances. This 19th-century theater is near the Basilica de la Macarena. For free flamenco shows, La Carboneria is a popular venue, but arrive early to score a seat. The Plaza de Toros de la Maestranza de Caballería de Sevilla is one of the finest bullrings in Spain, and with seating for around 12,500 spectators, it is also one of the largest. Built in 1761, it is an emblematic landmark of Seville and its famous tradition of bullfighting. The design is distinctly Baroque, with an oval-shaped ring that makes it unique among Spanish bullrings, and its graceful arcaded seating provides welcome shade on sunny days. Housed within the bullring is a museum with a collection of traditional matador costumes, as well as photographs and paintings related to the dramatic art of bullfighting. The Bullfighters' Chapel, where the matadors pray before a fight, is also worth seeing. This historic quarter of Seville has its own distinct character and identity. Across the river from the main tourist attractions of Seville, the quarter has the ambience of being a world apart. Similar to the Barrio Santa Cruz, the Barrio de Triana is a maze of narrow cobblestone streets and alleyways leading to atmospheric squares. What distinguishes the Barrio de Triana is its heritage as a traditional potters' quarter, as well as its Gypsy community. For centuries, the people of this neighborhood have used the clay from the banks of the Guadalquivir River to create authentic Andalusian ceramics. The ceramic workshops of the Barrio de Triana, mostly located on the Calle Callao, the Calle Antillano Campos, and the Calle Alfareria, are especially renowned for their fine azulejos, glazed ceramic tiles adorned with colorful geometric patterns—a legacy of Andalusia's Moorish aesthetic. The boutiques of this quarter also sell beautiful decorative ceramic plates, cups, pitchers, serving pieces, and other objects for the home. After browsing the little shops, tourists will be ready for a meal at one of the neighborhood's riverfront restaurants; many have outdoor terraces overlooking the monuments of Seville. An interesting trivia fact about the Barrio de Triana: From this quarter near the San Telmo Bridge, Magellan set out for his voyage around the world. The 16th-century Casa de Pilatos is believed to be a replica of Pilate's house in Jerusalem. Built by Moorish and Christian architects, the house features a variation of Mudéjar style, with Gothic and Renaissance details. Typical of Andalusian architecture, the building has a central patio adorned with azulejos (colorful ceramic tiles) and antique sculptures. The Salón Dorado (Golden Room) is a beautiful room with faience decorations and an artesonado (coffered wood) ceiling. The main staircase and the private chapel are also noteworthy. A collection of ancient Roman sculptures is displayed throughout the house. Located within the Parque de María Luisa, the Archaeological Museum of Sevilla occupies a Neo-Renaissance pavilion built for the Latin American Expo of 1929. The collection begins with the early Paleolithic period; continues with Phoenician, Greek, and Roman antiquities; and finishes with Moorish and Mudéjar items from the Middle Ages. The ground floor displays artifacts discovered at the Itálica archaeological site (nine kilometers away) in the province of Seville. Among the highlights are the gold jewelry and a statue of Diana. Another remarkable piece is the Carambolo Treasure from the Tartessian period, which is displayed in its own room on the first floor. This room contains a reproduction of the gold treasure and a shrine dedicated to Phoenician divinities. This impressive 15th-century town hall was designed in the Plateresque style by Diego de Riaño. The intricately carved reliefs on the southern facade depict figures from historical stories and mythology, as well as emblems of the storied founders of the city, Hercules and Caesar. The building was renovated in the 19th century with a Neoclassical main facade that looks out onto the Plaza Nueva. A small archway connects the town hall building to the adjacent Franciscan monastery. Tourists may make an appointment to visit the interior, which contains several important artistic works including a painting of the town's patron saints, Justa and Rufina. The Palacio Lebrija is a lovely aristocratic Sevillian mansion. The palace was designed to impress, with its grand staircase leading up to the second floor and gorgeous artesonado ceilings. The walls are decorated with Arabic-style plateresque ornamentation, and the courtyard is filled with Andalusian plants. This palace also displays archaeological treasures, including ancient mosaics, glasses, vases, and sculptures. This Monasterio de Santa Paula was founded by Doña Ana de Santillan in 1473 for the Jerónimas nuns. For five centuries, this monastery has been devoted to divine worship and the study of Scripture. Within the cloisters of the building, the monastery possesses an important art collection. Tourists can visit the monastery to discover its artistic heritage. Sometimes the nuns can also be found selling their handmade cakes and confections here. Luxury Hotels: For the old-world grace and elegance of a grand hotel, Hotel Alfonso XIII is Seville's top choice, right by the Alcazar and cathedral. Gran Melia Colon has stylish rooms and exceptional service in the fashionable shopping area near the fine arts museum, a 10-minute walk from the cathedral. At the edge of Santa Cruz, near Casa de Pilatos, a 10-minute walk to the cathedral, Hotel Palacio de Villapanes has a small rooftop plunge pool. Mid-Range Hotels: In the heart of atmospheric old Santa Cruz, close to the cathedral and Alcazar, El Rey Moro Hotel Boutique Sevilla has rooms that surround a lovely courtyard with a fountain. In a nice neighborhood less than 10 minutes from the cathedral, Hotel Becquer has large rooms, some with balconies, and views of the cathedral from its rooftop terrace and pool. Also with a rooftop pool, NH Sevilla Plaza de Armas sits near the river and the fine arts museum, a 10-minute walk from the cathedral. Budget Hotels: Monte Carmelo Hotel is on a pedestrian street in Triana, a picturesque neighborhood with lots of restaurants, just across the river from Maria Luisa Park and the historic center. Hotel Goya is in the heart of Santa Cruz, steps from the cathedral and Alcazar. In the central shopping area close to all the historic sites, Hotel America - Seville has underground parking for guests. See the Sights: If you plan to see most of the top attractions in Seville, the City Sightseeing Seville Hop-On Hop-Off Tour is a great-value and flexible option. You can hop on and off this open-top double-decker bus at any of 12 stops, including Plaza de España and the Tower of Gold. This ticket also includes an audio commentary, free entry to select museums, and four free walking tours, including a stroll around Seville Cathedral, and it's valid for either 24 or 48 hours, depending on your itinerary. 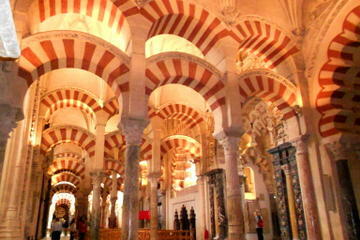 Cordoba Day Trip: To add some other evocative Spanish cities to your itinerary, consider the Cordoba Day Trip from Seville Including Skip-the-Line Entrance to Cordoba Mosque and Optional Tour of Carmona. This full-day tour explores the magnificent Moorish architecture and cultural attractions of this atmospheric Andalusian town, including the UNESCO-listed La Mezquita, the Jewish Quarter, and the Alcazar Fortress. Also included is an optional walking tour of Carmona, round-trip transportation by air-conditioned coach from your hotel, and handy skip-the-line entrance to some of the attractions. Granada Day Trip: The Granada Day Trip from Seville Including Skip-the-Line Entrance to Alhambra Palace and Optional Albaicin Walking Tour takes you to soak up the beauty of this Andalusian city at the foot of the Sierra Nevada Mountains. 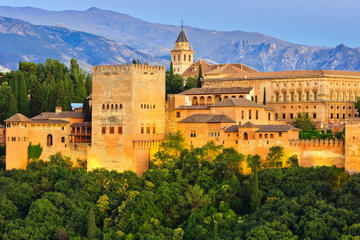 Highlights of this full-day tour include the UNESCO World Heritage-listed Alhambra Palace, with skip-the-line entrance to Nasrid Palace, Alcazaba fortress, Generalife Gardens, and Palace of Charles V, and an optional walking tour of the Albaicin quarter. Round-trip transportation, a guide, and hotel pickup and drop-off are all included. Exploring Andalusia: Once you've explored the top places to visit in Seville, you'll find plenty of other worthwhile destinations in Andalusia. It's only about a 90-minute drive to the fascinating Andalusian city of Córdoba. Here, you can see the magnificent UNESCO-listed La Mezquita (the Great Mosque) and wander the tangle of lanes in the enchanting Judería (old Jewish quarter), with its white-washed houses and charming squares. Drive about three hours east from Seville to explore the highlights of Granada, including the magical Alhambra, a UNESCO-listed complex of ornate palaces, a Moorish fortress, and luxuriant gardens.